Fashion is a common topic on the THP Forum, but it is almost always centered on adults. Many of us have children and a company by the name of Fore!! Axel & Hudson thought we’d like to share some of the fashion love with them. THP writer Jason Kunze and I were both able to let our children sample some of the company’s offerings so we could share our thoughts (and theirs) with our readers. Designer and golf-addict Paul Nguyen has been designing fashion for over 14 years – eight of which he spent designing children’s apparel for the likes of Lucky Brand, Babystyle and Baby Nay. It was the birth of his two children, Isabella and Hudson, and his intense love for the game that inspired him to create his own line. Fore!! Axel & Hudson draws upon the history of golf and its signature flair for fashion, innovating and reinventing the classic looks with hip, modern style. A stylish, sharp, golf-inspired collection for boys. Think country club meets California cool. An eco-friendly brand, we craft most of our pieces from ultra-soft and sustainable bamboo/spandex. As for the name “Fore” is an appropriate play on words, signifying both “For” and “Watch out!” — something you always need to do when active boys are around! Axel is the middle name that Tiger Woods chose for his young son, Charlie. Paul hopes that, someday, his son Hudson will hit the links with Charlie Woods. A golfing father’s dream! The Fore!! Axel & Hudson brand isn’t so much a golf apparel brand as it is a golf-inspired brand. They do have offerings that your children could wear on the golf course, but they are equally (if not more) suited for daily wear. In general, we found the styles to be on the dressier side and much different than your typical Midwestern kid’s fashion. Each outfit got comments from others about the hip look and the kids definitely enjoyed that. This is a great line to give your kids a little individuality and help them stand out in the crowd. Jason’s daughter, Sammy, sampled three items from the girl’s line that made up a cool little outfit. It consisted of the Double Plaid Fedora ($30), Pin-Tuck Eyelet Top ($39), and Reversible Skirt ($44). First impressions were that Sammy really liked the looks. She was excited to put the outfit on and was happy with how it felt. When she had the outfit on she felt like it was really comfortable and she thought she looked good due to the number of compliments she got. Sammy is 10 years old and the shirt and skirt are both size 10. The fit is very true to size. The shirt almost seemed like it would be too small, but due to the soft fabric and the stretch it turns out to fit perfectly. The skirt is “flowy” according to Sammy. Dad likes that the skirt goes down to just above the knee. The hat is a M/L and it fits her well. She would describe the fit of the hat as a little big, but going smaller would not work out well in my opinion. The shirt has ruffles on the trim of the collar and buttons as well as the sleeves. This adds to the look and dresses the shirt up nicely. The full outfit comes together nicely and Sammy thinks it would be a great outfit for school and/or church in the summer time. The hat is cool and is perfectly matched to the plaid skirt. When all together the outfit can be very versatile for many different occasions. The shirt and skirt have both been through the laundry multiple times and have come out ready to wear and looking sharp. A simple outfit to fold up and put in the dresser for a future use; the durability and ease of care makes this a worry free piece of Sammy’s wardrobe. The style is definitely a little dressier than something the kids will wear to go play in the yard in, but it is a great outfit to wear to school or to any of those other summer time functions that you want your kids to look good while attending. While wearing this outfit the word “comfy” was certainly the most used word when asking Sammy to describe it to people. The compliments really made Sammy feel like special the time she wore it to a family function. This outfit is definitely a conversation piece and quite catching to the eye. My daughter, who is six months old, got to wear the Eyelet Bubble Dress ($53). 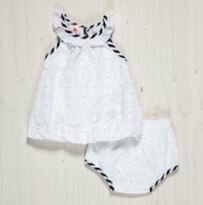 This is a 100% cotton dress that ranges in sizes 3-6 months up to 18-24 months. It comes with a matching diaper cover as well. At risk of sounding like too much of an adoring father, she looked like a little doll in it. The sizing was right in line with other children’s brands and it fit her quite nicely. The diaper cover isn’t as stretchy as some you’ll see out there, so make sure you’re grabbing the right size. The best news is that it fit over her giant baby head easily, which means less fuss when it’s time to get dressed. I’d love to share some of the baby’s thoughts, but all I could really tell was that she wanted to put the dress in her mouth like everything else she comes into contact with. Mom and dad definitely loved the look. The only downside I can think of with the Eyelet Bubble is the white color. Babies are messy, so make sure they are wearing a bib at meal time! My son, age 4, tried out a two-piece outfit for this review. He’s a big boy for his age, wearing size 5 this month. The items he sampled were the Pocket Spill Tee’s ($41) and Navy Linen Pant ($49). Like I said, my son is definitely large for his age and we do have problems keeping up with his growth, but both pieces of the outfit fit him nicely. This outfit really embodies the “California Cool” theme that the company touts. I’ve never seen an outfit quite like this one in the stores and could tell by others’ reactions that I wasn’t alone there. He liked the attention he got from wearing it and told me more than one time that he was cool with it on. My son loved the outfit. He’s an aspiring golfer, so the addition of screen-printed tees on the shirt immediately appealed to him. The pants were also very popular with him and have been worn many days thanks to a cooler than normal summer. One thing to note is that the pants are slim fitting and somewhat tapered, so if you’re child likes baggy clothes you may want to look at another option. Still, the lower portion did fit over his beloved cowboy boots, so there is a little room to move. The only complaint I can think of for this outfit is that the pants got pretty wrinkled in the dryer. They are 100% Linen, so that’s somewhat unavoidable. Typically, our kids’ clothes aren’t something we plan on ironing, so again, if that’s an issue you may want to look at different pieces in the Fore!! Axel & Hudson line. One final note that I should mention is that his mom absolutely loved this outfit. I could tell from the sounds she made when he first put it on that it was a winner in her book. It’s the time for back to school shopping and Fore!! Axel & Hudson has a large catalog of items that are definitely worth taking a look at. The styles are hip and definitely something that will get noticed. 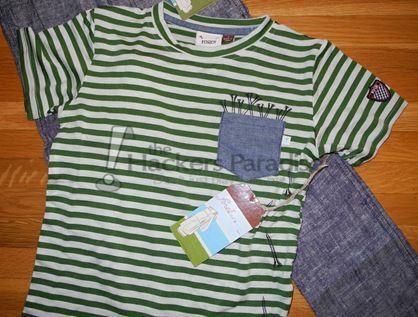 From what the kids tell us, these are cool clothes that they want to wear, which always makes parents happy. For more information and ordering information, check out the company’s website at www.foreaxelandhudson.com. Some sharp looking apparel for the kiddos! Cool to see that it wasn’t just “course inspired” wear as I thought it would be. Tad spendy for something they won’t get to wear year after year but looks to be very well made. This was a fun review for my daughter Sammy to participate in. She wears the outfit often and still continues to get great compliments on it. I would like to have had the skirt be a skort instead myself, just to let Sammy be active and not have to worry about any issues with a skirt. All in all it’s a great outfit and Sammy (and I) really like it a lot! 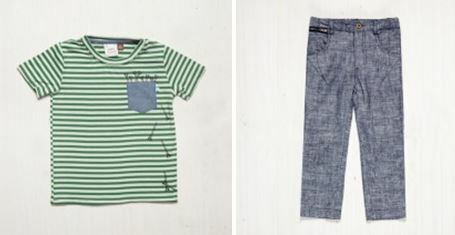 These are some hip kiddo clothes for sure! They go well down here in the Dallas area, esp. North Dallas. I could see my girls wearing some of these outfits. Went to the website and looked around some more. Like some of those pants (blue denim) that might be nice when it gets cooler. Thanks Hollywood! Ryler would definitely look great in some of these clothes for babies! She may have some of these under the Christmas tree this year! I think it’s an interesting concept. They certainly have a good selection on their website. Might have to grab some stuff for my niece in the future. Glad you guys were able to use your family to assist in the testing.